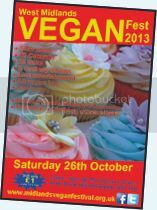 West Midlands Vegan Festival - you can help! Would you like to help make sure the festival is a big success? Please consider helping in one or more of the following ways. Become our friend on Myspace, Facebook, Twitter etc! Sponsor the festival or donate! We have thousands of vibrant colour leaflets(small A6 size) and posters (A4 size). We need your help to distribute them! We need to flood the Midlands (and beyond!) with leaflets/posters, anywhere that there are people who may be interested - so basically anywhere at all! Your school, college, cafe, workplace, library, church, community group, health food shop etc etc. If you're able to distribute/display some, or leave some where they can be distributed(ie. health food shop), we can post some to you, so please contact us stating the number you require and your address. Alternatively, you can download the full colour leaflet and poster in pdf format below. Please copy and distribute as many as you can. We have set up pages on Facebook and Twitter. Why not become our friend so you can stay tuned to event updates and forward them to all your friends! Post a comment to pledge your support. Help spread the word, join and share the event page on Facebook and become our friend on Twitter! Whether you're a business, organisation or just an individual, you can help us to ensure the event is a big success by becoming a sponsor or by donating whatever you can afford. MVC event co-ordinators are volunteers - all donations received will be ploughed into publicity etc. 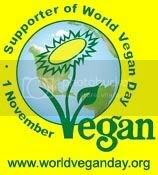 Please make cheques payable to 'Midlands Vegan Campaigns' and contact us for a postal address. Thankyou! co-ordination of volunteers - keep track of who's doing what and where!